For the first five minutes, the 16th-ranked Virginia Wesleyan Marlins looked quicker, stronger, better than the homestanding Randolph-Macon Yellow Jackets. Then the Jackets took a breath, stepped back, reassessed, and went on the attack. 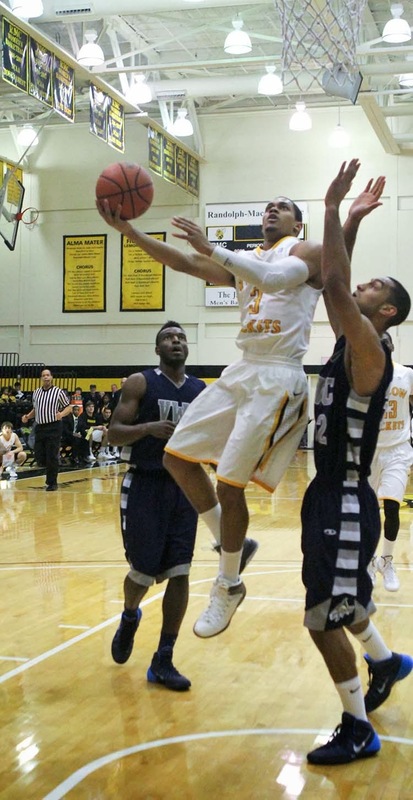 Fueled by an aggressive Akeem Holmes, Randolph-Macon erased a five-point Marlins lead with a 13-4 run just past the halfway point of the first half and never looked back, pulling away in the second half for an impressive 78-62 win in ODAC play Wednesday night at Crenshaw Gymnasium. "When they had the stretch where they took a seven-point lead, we knew we had to calm down and not lose our heads," Holmes said on the court after the contest. "We needed to take it slow, pass the ball, reverse it, and work our way back into it." That they did, with Holmes leading the way. The King William native kept the Jackets within striking distance as the team figured out how to answer the Marlins, then Connor Sullivan took over. Sullivan hit a basket, then a three-pointer after a Marlins timeout, stole the ball, drew a foul and hit two free throws to give Randolph-Macon the 23-22 edge at 7:52 left before intermission. By halftime, the seven-point hole was a seven-point advantage at 38-31. The Jackets flew out of the starting blocks in the second half, scoring five points in the first 90 seconds, holding Virginia Wesleyan to two points in the first five minutes. Andre Simon, who the Yellow Jackets with 23 points, forced two three-point plays, hitting one of two free throws for a five-point stretch to make it a 20-point Randolph-Macon lead at 53-33. The Marlins never threatened again. 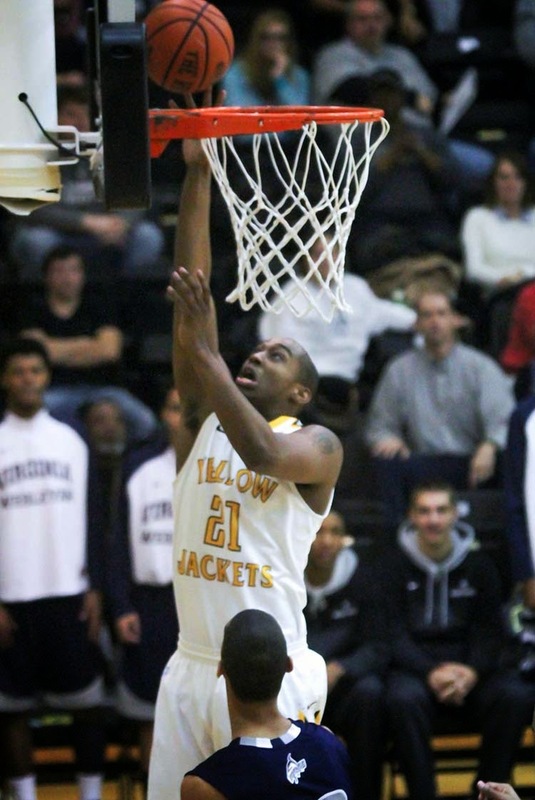 "We didn't have a ton of adjustments to make at halftime," Randolph-Macon head coach Nathan Davis said. "There were little things we've been working on that we had to reinforce. They (Virginia Wesleyan) were 5-for-8 to start the game, but Joe (Hassell) turned around and got a deflection. They tried to go to D.J. Woodmore and we were to make him step back and he couldn't get a shot off." It was that kind of disruption that kept the Marlins (5-2 ODAC, 12-4 overall) off-kilter for the rest of the game. Even when they added a full-court press to their repertoire midway through the second half, the Jackets broke it with ease, helping Randolph-Macon get easy baskets down low, an aid to their 54 percent shooting performance for the game. The Marlins shot 36 percent. Davis is not worried about a letdown when the Jackets battle Roanoke (1-6, 7-8) in the Star City on Saturday afternoon. "It comes back to maturity on our guys. Roanoke is a bit down the past few weeks in a stretch we started when we got after them," Davis explained. "Their coach is really good, he'll have them ready to go. Our guys have been around enough to know if we're not ready to fire around and make plays and defend, then we'll be in trouble." Game time Saturday is 3:30 after the Maroons and Jackets women's game at 1pm.